Jonathan and Nita were married on a stunning day in late August 2012. 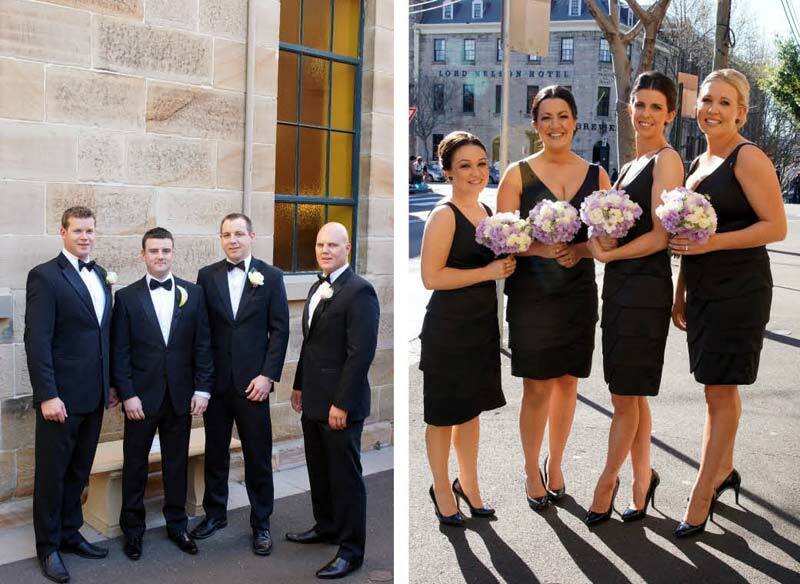 Their Sydney wedding made the most of what the city had to offer, hosting the event at Guillaume at Bennelong. Guests watched a golden sun sink behind the Harbour Bridge as they enjoyed fine wine and delicious canapes. All the special moments were captured by SugarLove Weddings. We met through work friends at after work drinks in November 2008. Jonathan proposed on New Year's Eve in Paris, on the balcony of our hotel overlooking the Eiffel Tower. He proposed with his Grandmothers ring which his father gave to him just before we left Australia. It made it all the more special and reinforced that not only was I going to become his wife but also going to become part of his family. Jonathan is English so we were able to travel to London and celebrate with his extended family before returning home. We always wanted a formal black and white wedding with vintage touches. We chose lavender and mauve flowers to add a hint of colour in the wedding party and table settings. Our reception was held at Guillaume at Bennelong. The views and location were big draw cards but we chose the venue because of the exceptional food and wine that Guillaume is renowned for. Our ceremony was held at St Brigid's Catholic Church in Miller Point, Sydney. We only had a small number of guests so we didn't want the Church to overwhelm our wedding. The sandstone courtyard was so picturesque and perfect for family photos. We held an informal rehearsal dinner at Firefly Restaurant in Walsh Bay. We live in Brisbane now and had a number of guest travelling interstate and from overseas so it was great to be able to send that extra time with everyone catching up getting excited for the big day ahead. I wore a silk tulle asymmetrical gown from Lisa Ho. My veil was given to me by my mother and was a soft tulle floor length veil from Johanna Johnson. I wore a headpiece by The Babushka Ballerina and shoes by Christina Louboutin. For the reception I wore a silk satin Grecian style gown with a black satin belt, also by Lisa Ho. Jonathan wore a Dinner Suit by Hugo Boss, the Bridesmaids wore black Stain cocktail length dresses from Review and groomsmen wore dinner suits from Spurling Formal wear. My bouquet was a combination of white and cream lilies, roses and sweet peas in a nod to Jonathan's grandmother Lilly. I tied Lilly's wedding ring to my bouquet so it was close to me during the ceremony.The girls bouquet were a combination of sweet pea, fressia and roses in soft mauves and cream. We made a donation on behalf of each guest to the White Ribbon Organisation and gave each guest a mix tape of songs from our wedding in lieu of having dancing on the night. My brother walked me down the aisle which was an important moment for us as a family.Our guests gathered on the private balcony as the sun was setting over the harbour which was a special moment for everyone at the wedding. Finally, the speeches were very heartfelt, especially from our parents and capped off the night perfectly. We honeymooned in New York. Planning a second honeymoon and a family in the years to come. Leigh and Bradley were lovely to deal with and helped us immensely to achieve what we wanted - to capture the story of our day so we would always be able to look back and remember what it felt like. They worked within our budget, worked with us over teleconference because we were located interstate and were so lovely to deal with on the day. Absolute professionals and lovely people too. Our favourite photos are the ones that capture a moment in our day so we can remember how it felt to be there. There is a great balance of 'wedding shots' and 'candid shots' and we have some great photos of the two of us, our guest and the beautiful locations without it feeling too posed or contrived.